« Say the Wrong thing at the Right time? 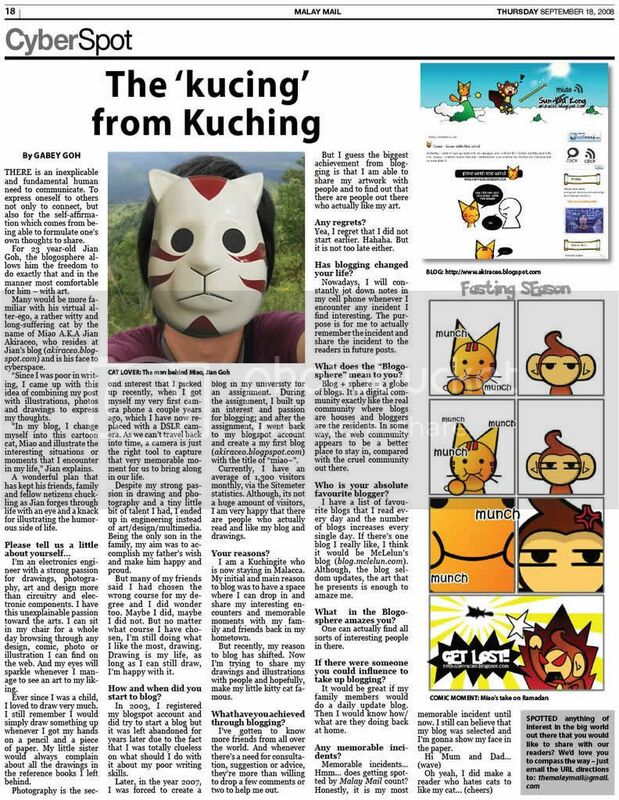 Posted on May 24, 2009 by Jian Akiraceo. This entry was posted in Outdoor and tagged cat at the gym, cat training, comic, gym, the rock cat. Bookmark the permalink. Hahaha don’t want so muscular..
Wow, cute blog and nice comic. 🙂 You really have a great blog here. I never went to gym before because I feel that it is quite expensive. lol. 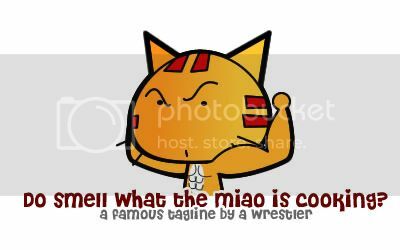 Hahaha i see i see..
but to me, Miao won’t look so kewl with massive muscles!!! but at least you can keep your health better by exercising…. Don’t want.. I will look weird if I have massive muscle..
i used to go to the gym..
but now i stopped edy.. no time i guess..
yeah i got tyres around my tummy edy too.. haha.. The air bags came back eh? Gasp! If you go to the gym, you’ll have less time to blog! Nooooo~!!! I go gym everyday until now already become a routine. Anyway, I hope you didn’t sprain your muscles for engaging in such strenuous exercise during your first visit. haha!! soooOOOOoooOOooo cute larh the way u wrote it!! 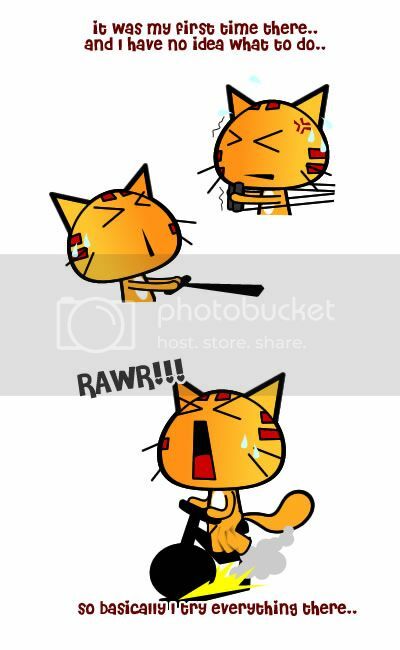 hhahaha.. the cartoon even cuter!! yalo..miao with 4 or 6 pax doesnt look cute bo.. miao owez looks cute with 1 sack (perut buncit). I just dislike the smell of the place..
smelly & hot gym? sure the experience not good. at least go until ur FIT again. no need to go until ur muscular la.. When you’re muscular enuf,go put on a red cape+undies and turn around. Yeah.. over is too much for me..
Work hard and must exercise more too. I also dont like to take sport in a closed space. weekend gotta hang out with friends to catch things up, then need to sleep to replenish all the deprived sleeping time of work days… sighh…. Hahaha there’s a saying that.. no matter how you sleep, you will never return all the sleep you lost before. 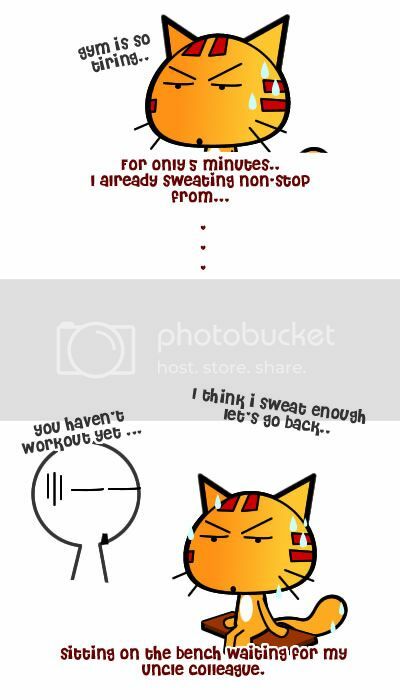 cute comic as always..o nice la your company gives free gym membership…Where are you working ? I’m currently working in a manufacturing factory in Melaka. He’s now at Baskin-Robbins,eating ice-cream. Maybe you no longer look cute when you’re ripped with muscles but I bet you’ll look like a tiger! RAWR!! Hear me ROARRRR!!! lol. Hahahaha! XD I totally get ya. My first time at gym was damn weird. Luckily I went with a friend and the trainers were guys so… ya larr, they liked my friend so it was easy to get about (the benefit of damn good looking/cute gal-friends, heh). But unlike you, I kept it a secret (more like, unless they ask, I won’t tell sort of thing) from everyone. Damn embarassing lah. Still, I always heard that if u just do cardio u won’t gain too much mussle but just loose lots of weight and slim down. N the weight lifting… if you only do a lot of time but with the same weights, you’re fine. It’s when you keep putting more weight that’ll draw more mussle to yah. Anyway, Bad/Good things are meant for sharing 😛 . So I don’t mind talk about it even its embarrassed me :P.
Oooo I see I see..